Carol was an exceptional Tour Guide. Her passion and knowledge of Torino was contagious. She made an instant connection with all four us. Living Torino with a well rounded local was an enriching experience for me and my family. She gave us excelent local recomendations of restaurants, coffee shops and a chocolate heavenly place!! I highly recommend Carol for your next unforgettable experience. TOUR GUIDE RESPONSE: Thank you so much Maria. You were amazing too ! We did the tour on Dec. 31: best way to celebrate New year's eve !!! We only had 2 nights in Torino, and are ecstatic that we found Carol to share one of our days. When I think back to everything we learned about Italian history, as well as exposure to some wonderful Italian cuisine, it becomes clear that we need to plan another visit to Torino. There was the wonderful chocolate shop, and we and our friends are still enjoying. The cheese tasting was one of our highlights-and they shared their homemade whipped cream. Thank you Carol for your passion about your city! Carol B is a wonderful guide. Fun and knowledgeable. She shares the history as well as current events that shape the area. By the end of the day we were fast friends. We thoroughly enjoyed our day with her and highly recommend her. Carol was great! The day before we had an overview walking tour of the city. With Carol, we entered the different sites and she explained everything with enthusiasm and knowledge. This was a sugar and cacao fueled journey to various historic chocolatiers for which Torino is justly famous. The opportunity to view the heritage stores, meet hospitable store attendants and taste samples, in the style of a wine tasting, opened our palate to real chocolate and deliciously gave us insight into this venerable local specialist tradition. An excellent overview of Torino. Touching on key historical points and personalities, visiting main buildings and sites. At the end of the tour we felt we had a better understanding of the essential character of this city. We toured Turin with Carol July 3rd and were very happy with the experience. She was friendly, accommodating, informative, and everything one could want in a tour guide. Turin was an extraordinary city beyond our expectations, and we were happy to share it with Carol and would highly recommend her. Carol customized this trip for our group of five to focus on the Egyptian Museum. She is an accomplished museum guide, among her other guiding talents! Her English is excellent and easy to understand. Her voice carries well so that we all could hear her easily as she guided us through the museum. And her knowledge is truly amazing. You will marvel at her detailed explanations of the museum exhibits and back stories behind them. It is so much better than any headset to have a guide like her. Carol is a truly gifted guide! She customized this tour for our party of five to focus on items of our interest. She has a wonderful personality and is so easy to talk with. Her English is perfect and very easy to understand since she grew up in Canada, but her knowledge of Italy and particularly Turin and its history is amazing. We have used local guides many times throughout Europe and Australia and Carol is probably the best we had had or could wish for. Carol was charming and informative and provided a great launchpad and grounding for exploring the city and food shopping on our own later. Carol was knowlegable, friendly, well informed about the region, the people, the history. She was on time, and even took time to contact us ahead of time to be certain everything would be on schedule and a go. We highly recommend her. Thanks for a great experience! Very flexible, personable & informative. Carol is passionate about her subject matter but keeps her dialogue to a level that maintains her clients interest. She was also very sensitive to our specific needs. Relaxed, enjoyable & we saw parts of Turin we otherwise would not have seen. Thoroughly recommended. Carol was brilliant , and so knowledgeable about Turin , we had a lovely tour , she was very patient and personable with my elderly father and mother. Would highly recommend this tour as it was a real glimpse of the life of the locals in Turin. Wonderful overview of Turin tailored to our interests!! Highly recommended! TOUR GUIDE RESPONSE: Thanks beautiful family ! Enjoy the rest of your trip here in Piemonte. Carol is an expert guide--she tailored the tour to our interests and we got to see the best of Torino. TOUR GUIDE RESPONSE: Thank you for joining me on my tour. Io e sas lunch? Chiara at latteria Bera told me you sud hey chiese rating the day after our tour: brave ! I'm' sure you enjoyed it ! Are you in Oregon ! My husband and I thoroughly enjoyed the Jewish Heritage Tour with Carol. We also opted to go inside the synagogue, where we had a guide, Barok (sp?) from the Turin Jewish community, who educated us about the daily life of Jews during the ghetto period and the building of the synagogue. Carol then took us on a walk to the ghetto where she pointed out unique aspects of the buildings. Along the way she answered our questions about Turin and its history We ended at the Mole Antonelliana. Great info and a terrific tour. Took us to all the significant Italian Job sites and great walk through Turin. Any Mini enthusiast would love this tour. This was our first trip to Torino and Carol provided a wonderful tour of the city and gave us great insights to the people, culture, cuisine and history. She is very knowledgeable and paced the tour to our needs and desires. She hit all of the highlights of the central city but also gave us number of insights to the hidden parts of this great town. We highly recommend her for your touring needs in Torino and the surrounding areas. This was a terrific experience. Carol was prompt and professional, arriving at our door right on time, ready to show us her beautiful city. We found her to be very knowledgable about Turin,and was really adept at adjusting the tour to accommodate our specific interests and questions. Everything we wanted to see and do was included and every question we had was answered. At the end of the tour, she left us at a wonderful restaurant we would never have found. Mille Gracie. Carol customized a tour for me to the nearby town of Collegno, the town from which my great-great grandparents came. We visited 2 churches that were around in the 1800s and the town cemetery. Carol is so friendly and did not hesitate to speak to the locals and ask questions to help me find leads in my family history search. I will be back! I took the Torino Discovery Tour with Carol and loved it! She's a wealth of knowledge on the history of the city and region, from the Savoy family, to the architecture, the culture, even Torino's cocoa history. We went to the farmer's market at Palazzo Di Citta, where we sampled food from nearly every vendor. She took me to the Guido Gobino chocolate shop and introduced me to gianduiotto (hazelnut chocolates). Carol is easy to talk to, very knowledgeable, accommodating, and I highly recommend her. TOUR GUIDE RESPONSE: Thanks Anita for the 5 stars !!!! Carol was fantastic. Her knowledge of Turin was thorough and Carol delivered it with passion. Her English was fantastic. The tour itself was an easy walk. Carol helped us with other things like questions we had on restaurants, shopping and the city's rules on driving in the city. I would highly recommend Carol as a guide especially if your language is English. Christine V.
Carol was a knowledgeable guide and a delightful person to lead us through the sites and history of Turin. My wife and I thoroughly enjoyed the tour. Thank you, Carol, for making it such a great experience for us. Although HQ screwed up our reservations we managed to meet Carol on 45 minutes notice. She is a great guide but had to work adhoc/with out reservations & we went to only one wine tasting but had a great lunch. A little pricey for almost $1,000 for the day! I had a great time on my tour with Carol! She was so knowledgeable about the city. Carol tailored the tour to my interests and expertly guided me through some of the most renowned areas of Turin. She was easy to work with and really helped to make my weekend in Turin a fantastic experience. Thank you! Carol was wonderful, and so was Marco! One of the best guides ever, and it made for a once in a lifetime experience !! I would recommend using Carol ( and Marco) to everyone. TOUR GUIDE RESPONSE: I am really glad you enjoyed the tour !!! Had an fantastic time with Carol. I had been walking all around the historical area of Turin the day before but learned and did more in just 3 hours with Carol. She has excellent knowledge of the city for sure, but having her point out hidden features that I would never have thought to look twice at that was the most interesting and valuable part. Carol was on time for our appointment and was flexible to cater to our walking speed and things we wanted to do (eating, shopping, etc.). Highly recommended! Carol was a wonderful guide! She was friendly, personable, knowledgable and fun and we had a really enjoyable morning with her looking round Lingotto, visiting the Agnelli collection and then being shown different parts of the city. She was able to explain lots of interesting details about Turin and was also really helpful in suggesting restaurants and bars for us to try. I would definitely recommend her. She was an excellent tour guide, knowledgeable and very pleasant! TOUR GUIDE RESPONSE: Grazieeee !!! Carol was so informative. We thoroughly enjoyed the tour. She was also flexible since are train was late. She was very knowledgeable about Torino. We had a delightful day. Carol was extremely informative with a great sense of humor. She took us to several locations where we could experience a lot of the local culture. Our group was extremely pleased with the service and tour we received with Carol. She was extremely responsive while we were planning our tour and she was willing to be flexible with respect to what we saw. She is very knowledgeable and was a pleasure to spend the morning with. She followed up after our tour as well to make sure that all was well with our travel plans. TOUR GUIDE RESPONSE: Thank you Elaine. I was in Fosssano this past weekend to watch performances at MIRABILIA, circus and performing arts festival. We actually watched a show that took place right in front of the Castle at sunset . . . very romantic. Unfortunately, it was boiling hot: we presently have an average temp. of 40 C . . .Ciao from steaming hot Piemonte ! Carol was very accomidating as we went through the tour with a sick child. We enjoyed and appreciated her knowldgable commentary on the Shroud and the city of Turin. TOUR GUIDE RESPONSE: Thank you Bridget ! I hope you are having a ball in Rome !!! The tour was pleasant enough but not very informative or well thought out. It is a little strange to have the guide ask "what would you like to see?" When one has requested a tour of the city. I don't know what I should see! That's their job! TOUR GUIDE RESPONSE: I provide customized tours to suite your requests so I had asked what you'd like to see.You told me that you & your husband had been to Torino several times, you know Torino very well and the tour was especially meant for your friends so I asked if there was anything in particular you'd like to show your friends.I try to understand what the focus of the group is in order to show them places that could be of interest.Sorry that you felt my tour was not thought out,I'll take that into consideration. TOURSBYLOCALS RESPONSE: We always encourage our guides to customize the tour before and after meeting the traveler. That special and nice connection between a traveler/guide is the main advantage of a private tour. If travelers are not sure which is the best itinerary for their tour, then they can just rely on the guide´s decision and enjoy their tour. A very enjoyable experience, if you are into the Italian Job film then this is a must do, you get to see so many locations within the city that you would never find yourself or be suprised that this is where it all happended, our guide could not have been more helpful and so knowledgeable about many things in Torino, i would not do a city trip again without using this service its invaluable if you have little time to spend and want to see as much as possible. Carol was very flexible and accommodating. I had spent a few days in Turin walking around the city on my own. The city walk with Carol provided way more insight than I had expected and the conversation throughout was terrific. It was an extremely enlightening experience and I learned the entire walk, even after walking by many of these attractions on my own! There is nothing better than an infectious pride for a city and Carol definitely has that for Torino! TOUR GUIDE RESPONSE: Thank you so much Frank. On Mondays I attend a yoga class and this past Monday one of my yoga pals was very excited and restless .. . guess why ? Juventus was playing that night and she just couldn't wait to get back home, get in her car, drive to the other side of town to join her sister and friends to watch the game. AHI AHI AHI these Juventus fans . . . Ciao Frank. Carol is a brilliant guide and a delightful companion. After the tour was over we were amazed at how much ground we had covered and how much we had learned in such a short time. The experience was more like being shown around by an old friend that by a tour guide. Although her style was informal, Carol packed in a huge amount of history, knowledge of the wonderful city of Turin and insight into day-to-day life in Piedmont. Also, she introduced us to Bicerin, the drink and the cafe. Delicious. Carol was very helpful. Even at a short notice, she helped us book the most fabulous resturant in Turin for lunch (highly recommend slow food). Afterwards, she took us through the main square in Turin and through the palaces and the Church of the Shroud. She is very knowledgeable and was able to make the tour interesting for two adults and two not very interested young boys. Thanks Carol. Expert guide, speaks very good english, energetic, loved what she does and it came through loud and clear. Very good tour, Carol's fluent english and italian made it easy to follow the specific details about the city! We all loved the stories about the history of Turin and the good choice/mix of places to visit. TOUR GUIDE RESPONSE: Thank you Matthias ! We had a great tour with the lovely Carol. She has a great cultural, historical and culinary knowledge of Torino. Thanks to her we met some of the market traders, had a bicerin at an old café and a great lunch at a modern place. In between she showed us the beautiful places of the city. It was a great way to experience Torino. If you visit Torino, do take a tour with Carol. Carol was warm, knowledgeable, and fun. We had an instant connection. The tour was a wonderful experience as it helped me understand some family history. TOUR GUIDE RESPONSE: Thank you so much Ron ! Carol is very professional and always try to satisfy our changing needs. We cannot say enough great things about the wine tasting tour that Carol B. put together for us. After exchanging inquisitive and witty emails she perfectly customized a day trip to the wine country outside of Tornio, Italy that we are still talking about two months later. And I think she enjoyed the trip as much as we did! She also recommended a place for dinner in Tornino and called and made our reservation for us. It too was quite a treat. This is a great way to do sightseeing. would definitely recommend the tour and the guide to others. Torino is a great city and Carol's introductory tour hit the high spots. Even more enjoyable was the wine tasting where we learned about a new grape (for us) and tasted some wonderful wines. Carol was fantastic. She was willing to adapt the tour to my interests and we visited several wonderful towns in the Langhe area outside of Torino and had a fantastic lunch in Alba. She speaks perfect English and Italian and is amazingly knowledgeable about the Piedmont region. I couldn't have asked for more in a guide. My second day with Carol. We went farther out from the center of Torino including across the Po river for lunch. Carol is extremely personable and fantastically knowledgeable about Torino, it's history, culture, people, etc. You couldn't ask for a better tour guide and although she is a Torinese, she was born in Canada so she speaks perfect English. My first day with Carol. We hit it off immediately. Her perfect Italian and English make everything go smoothly. 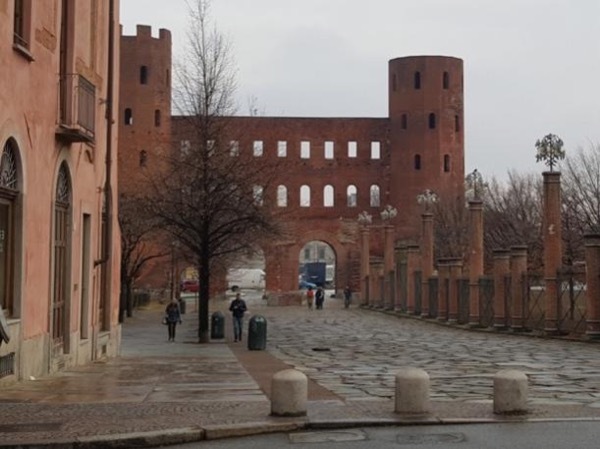 We concentrated on the historical center of the city including it's Roman origins and the influence of the Savoy family on the history and fortunes of Torino. Carol is very personable and knowledgeable and one could hardly ask for more in a tour guide. She lived in Torino and knew everything about the Barolo and Babaresco area. During the winery tour, we decided to change restaurant and she made a reservation for us in an Alba Michelin ranked restaurant. We are 100 per cent satisfied with our guide. The guide also had perfect knowledge of Barolo and Babaresco wine and everything in Torino. We had a wonderful experience. Thank you. My clients were so pleased with Carol as a guide, and with all the places (especially the chocolate factory)she took them to...they rated her a 10+ I appreciated the information Carol emailed me on the original hotel they had been booked into allowing us to transfer them without interruption in their trip. I recommend Carol very highly. Carol designed a tour that met our preferences, has a pleasant and relaxing conversational style, and is knowledgeable about the wine, food, and culture of the area. My wife and I enjoyed our day with Carol and came away with a deeper knowledge of the Langhe wine-producing region. We would recommend Carol to others seeking an enjoyable and informative day visting the sites and learning about the wines of the region. We enjoyed the 2 days of tours very much and greatly appreciate the friendliness and local knowledge shown by Carol. The Alba tour (second day) was very well organised and couldn't be faulted. Perhaps the tour of Asti could have been a bit better organised with a different winery next time as we were all a bit hostage to the Barldovino family that day. Overall I would highly recommend Carol as a tour guide to friends.